I very rarely blogabout anything other than SQL Server but felt that with a lot of the SQL Community using SP3’s that this may actually be helpful to some. After playing around in a VM for a while now I decided to upgrade my SP3 to Windows 10 which comes as a free upgrade. I was surprised that after making the schoolboy error of believing my charger was actually charging the unit during the upgrade and the battery running flat 30% through the upgrade, it fired back up and started off from that point with no issues whatsoever! I honestly thought that was it and it would be a factory reset. I won’t go on about what’s changed, what I like and what I don’t like, you can read plenty of that around on the internet and it is out of the scope of this blog post. However, I did discover one issue which I know several others have had when upgrading their SP3. After the upgrade I could no longer send emails via (IMAP) outlook. I could send via every other device so knew it was specific to the upgrade. I managed to find a couple of others on the windows forums with the same issue and they provided the solution which I thought I would share. 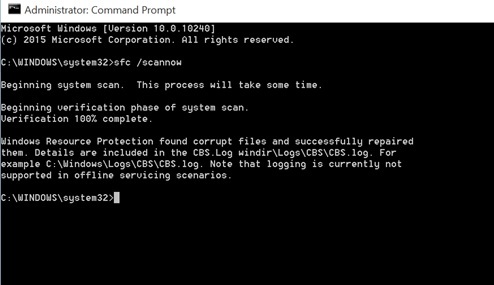 The fix is actually very simple, all you need to do is open a command prompt, run sfc /scannow and wait ~10mins. I won’t go into details of the log file but the repaired file was related to the “Multilingual User Interface” (mui) files, which are translation files used to support different languages within windows. Mine in particular was mlang.dll.mui. So, after a mild panic the fix was relatively straight forward……once I knew what the problem actually was!